AcadCalcStair: is the program for calculations in AutoCAD (any formats of numbers) and Stair & Rail drafting. With this program you can do mathematical operations; calculations of triangles, slopes and stairs. Results of calculations can be used directly for performing AutoCAD commands: move, copy and others. Options: copy and paste numbers (decimal or architectural formats) in AutoCAD MText or Text editor; write calculations and add comments in Protocol, copy and paste contents of Protocol in any Text editor (Word or Notepad); get distances from AutoCAD and use them in calculations; set parameters and draw stair (plan and elevation view). 20 programs in one package, 30 forms, 362(!) VB and AutoLISP routines: Structural & Arch. 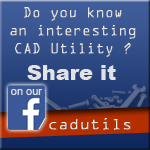 Design/Drafting, Steel Detailing + general AutoCAD utilities.